Tools for screwing tubes of chronograph pushers. Sold Individually, available in three sizes. #5901-P03 for 3.33 mm tubes. #5901-P27 for 3.65 mm tubes. #5901-P39 for 4.10 mm tubes. 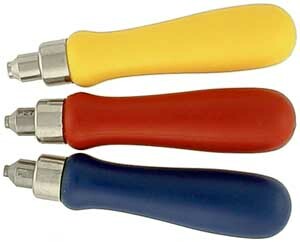 Pliers for removing pushers and correctors of watch cases, supplied with 3 punches. In cast aluminium with adjustable stoppers. Measures 145 mm in length. Pliers for fitting pushers and correctors of watch cases, supplied with 2 punches: 1.9 mm and 2.4 mm. In cast aluminium. With adjustable stoppers. Measures 145 mm in length. 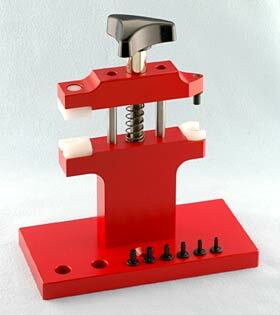 Tool for assembling/disassembling screw-on pushers and tubes. Interior diameter: 3.10 mm. 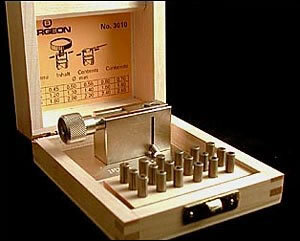 This tool will set and remove most standard 4.0 mm outside diameter chronograph buttons, which have tubes with thread size 3.00 which is a size not available from Bergeon. 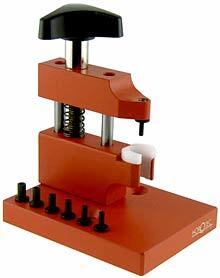 The tool comes with 17 interchangeable keys for screw-on pushers or tubes, oscillating weight bolt and battery cover. 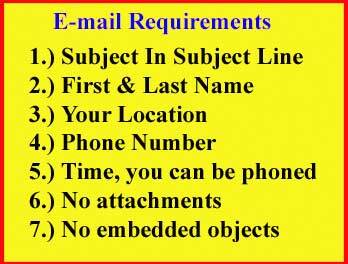 It can be use on Rolex�, Breitling, Omega and Swatch movements. The kit features 17 keys, the master handle and a weighted storage base to keep all of the items organized and accessible. 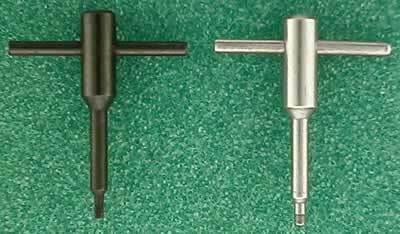 These tool bits are for Horotec Generic Rolex� Tubes: MSA-03.620-01 diameter 1.50 mm works on MSA-65.001 screw on tube , MSA-03.620-02 diameter 1.80 mm works for MSA-65.002 screw on tube, MSA-03.620-03 diameter 2.65 mm works for MSA-65.003 screw on tube, MSA-03.620-04 tube diameter 2.75 works for MSA-65.004 screw on tube, MSA-03.620-05 tube diameter 2.95 mm works for MSA-65.005 screw on tube, MSA-03.620-06 diameter 3.00 mm works for MSA-65.006 screw on tube, MSA-03.620-07 diameter 3.00 mm works for MSA-65.007 screw on tube. 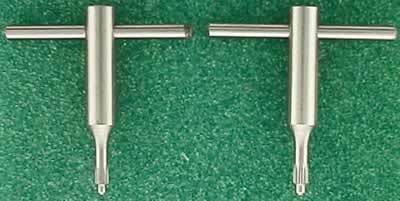 The Horotec Generic Rolex� tubes can be found on page 73 of the Horotec 2005 Watch Parts Service Catalog. 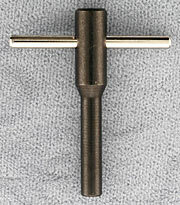 Similar to the MSA03.656, but only removes pushers, NOT for fitting pushers. Delivered with 7 stakes (exterior diameters are 2.95mm, 2.65mm, 2.45mm, 2.15mm, 1.95mm, 1.75mm, and 1.55mm) and 1 MSA03.654-H Delrin unfitting support die. The dimensions for this tool is 45x60x7.8 MM. It isn't always easy to drive out the pushers without damaging the piece. 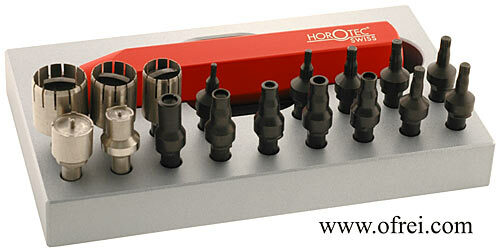 But with this Horotec Pushers-Press, fitting and removing press-in pushers will be a snap. You can now get the job done of fitting and removing quickly and safely using the right diameter pusher punch bits. Equipped with 7 pusher punch bits and 3 delrin support dies. 03.654-H is the unfitting support die that is made of delrin material. 03.656-A is the lower fitting support die. 03.656-B is the upper fitting support die. Individual replacement parts for MSA03.654 & 03.656: MSA03.654-A, MSA03.654-B, MSA03.654-C, MSA03.654-D, MSA03.654-E, MSA03.654-F, MSA03.654-G, and MSA03.654-H.